Save 32% with this bundle! 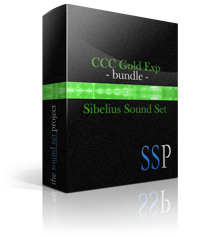 The Complete Composers Collection sample libraries must be purchased separately. This product facilitates use of the Complete Composers Collection libraries in Sibelius. IT IS NOT A SAMPLE LIBRARY and DOES NOT CONTAIN ANY SOUNDS. To purchase the Complete Composers Collection libraries, please visit the EastWest website: Soundsonline (US & World) / Soundsonline EU (Europe). Complete Composers Collection, QL Goliath, QL Pianos Gold, QL RA, QL Stormdrum 2, QL Stormdrum 2 Pro, QL Voices of Passion, Symphonic Choirs, Symphonic Choirs Expansion, and Symphonic Orchestra © East West Communications, Inc..